Output from a shallow water equation model of water in a bathtub. The water experiences five splashes which generate surface gravity waves that propagate away from the splash locations and reflect off the bathtub walls. The shallow water equations (also called Saint-Venant equations in its unidimensional form, after Adhémar Jean Claude Barré de Saint-Venant) are a set of hyperbolic partial differential equations (or parabolic if viscous shear is considered) that describe the flow below a pressure surface in a fluid (sometimes, but not necessarily, a free surface). The shallow water equations can also be simplified to the commonly used 1-D Saint-Venant equation. The equations are derived from depth-integrating the Navier–Stokes equations, in the case where the horizontal length scale is much greater than the vertical length scale. Under this condition, conservation of mass implies that the vertical velocity of the fluid is small. It can be shown from the momentum equation that vertical pressure gradients are nearly hydrostatic, and that horizontal pressure gradients are due to the displacement of the pressure surface, implying that the horizontal velocity field is constant throughout the depth of the fluid. Vertically integrating allows the vertical velocity to be removed from the equations. The shallow water equations are thus derived. While a vertical velocity term is not present in the shallow water equations, note that this velocity is not necessarily zero. This is an important distinction because, for example, the vertical velocity cannot be zero when the floor changes depth, and thus if it were zero only flat floors would be usable with the shallow water equations. Once a solution (i.e. the horizontal velocities and free surface displacement) has been found, the vertical velocity can be recovered via the continuity equation. Situations in fluid dynamics where the horizontal length scale is much greater than the vertical length scale are common, so the shallow water equations are widely applicable. They are used with Coriolis forces in atmospheric and oceanic modeling, as a simplification of the primitive equations of atmospheric flow. Shallow water equation models have only one vertical level, so they cannot directly encompass any factor that varies with height. However, in cases where the mean state is sufficiently simple, the vertical variations can be separated from the horizontal and several sets of shallow water equations can describe the state. Here η is the total fluid column height, and the 2D vector (u,v) is the fluid's horizontal velocity, averaged across the vertical column. g is acceleration due to gravity. The first equation is derived from mass conservation, the second two from momentum conservation. The one-dimensional (1-D) Saint-Venant equations were derived by Adhémar Jean Claude Barré de Saint-Venant, and are commonly used to model transient open-channel flow and surface runoff. They can be viewed as a contraction of the two-dimensional (2-D) shallow water equations, which are also known as the two-dimensional Saint-Venant equations. The 1-D Saint-Venant equations contain to a certain extend the main characteristics of the channel cross-sectional shape. The 1-D equations are used extensively in computer models such as HEC-RAS, SWMM5, ISIS, InfoWorks, Flood Modeller, SOBEK 1DFlow, MIKE 11, and MIKE SHE because they are significantly easier to solve than the full shallow water equations. Common applications of the 1-D Saint-Venant equations include flood routing along rivers (including evaluation of measures to reduce the risks of flooding), dam break analysis, storm pulses in an open channel, as well as storm runoff in overland flow. Cross section of the open channel. where x is the space coordinate along the channel axis, t denotes time, A(x,t) is the cross-sectional area of the flow at location x, u(x,t) is the flow velocity, ζ(x,t) is the free surface elevation and τ(x,t) is the wall shear stress along the wetted perimeter P(x,t) of the cross section at x. Further ρ is the (constant) fluid density and g is the gravitational acceleration. Closure of the hyperbolic system of equations (1)–(2) is obtained from the geometry of cross sections – by providing a functional relationship between the cross-sectional area A and the surface elevation ζ at each position x. For example, for a rectangular cross section, with constant channel width B and channel bed elevation zb, the cross sectional area is: A = B (ζ − zb). The wall shear stress τ is dependent on the flow velocity u, they can be related by using e.g. the Darcy–Weisbach equation. Further, equation (1) is the continuity equation, expressing conservation of water volume for this incompressible homogeneous fluid. Equation (2) is the momentum equation, giving the balance between forces and momentum change rates. 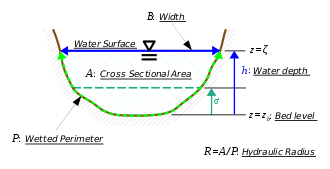 Further note that – for non-moving channel walls – in the continuity equation (1): ∂A/∂t = B ∂ζ/∂t = B ∂h/∂t , with B(x,t) the momentary width of the free surface in the channel cross section at location x. Above – in the momentum equation (4) in conservation form – A, I1 and I2 are evaluated at σ = h(x,t). The term g I1 describes the hydrostatic force in a certain cross section. And, for a non-prismatic channel, g I2 gives the effects of geometry variations along the channel axis x. In applications, depending on the problem at hand, there often is a preference for using either the momentum equation in non-conservation form, (2) or (3), or the conservation form (4). For instance in case of the description of hydraulic jumps, the conservation form is preferred since the momentum flux is continuous across the jump. 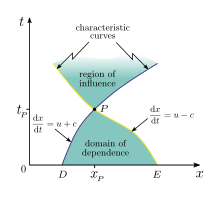 Characteristics, domain of dependence and region of influence, associated with location P = (xP,tP) in space x and time t.
The Froude number F = |u| / c determines whether the flow is subcritical (F < 1) or supercritical (F > 1). The Riemann invariants and method of characteristics for a prismatic channel of arbitrary cross-section are described by Didenkulova & Pelinovsky (2011). The characteristics and Riemann invariants provide important information on the behavior of the flow, as well as that they may be used in the process of obtaining (analytical or numerical) solutions. The dynamic wave is the term used to describe the full 1-dimensional Saint-Venant equation. It is numerically challenging to solve, but is valid for all channel flow scenarios. The dynamic wave is used for modeling transient storms in modeling programs including HEC-RAS, InfoWorks, MIKE 11, Wash 123d  and SWMM. The kinematic wave is valid when the change in wave height over distance and velocity over distance and time is negligible relative to the bed slope, e.g. for shallow flows over steep slopes. The kinematic wave is used in HEC-HMS. The diffusive wave is valid when the inertial acceleration is much smaller than all other forms of acceleration, or in other words when there is primarily subcritical flow. Models that use the diffusive wave assumption include MIKE SHE and LISFLOOD-FP. where u is the velocity in the x-direction, v is the velocity in the y-direction, w is the velocity in the z-direction, t is time, p is the pressure, ρ is the density of water, ν is the kinematic viscosity, and fx is the body force in the x-direction. where fx,g is the body force due to gravity and fx,f is the body force due to friction. where Fg is the force of gravity in the x-direction, θ is the angle, and M is the mass. Figure 1: Diagram of block moving down an inclined plane. where (a) is the local acceleration term, (b) is the convective acceleration term, (c) is the pressure gradient term, (d) is the friction term, and (e) is the gravity term. The local acceleration (a) can also be thought of as the “unsteady term” as this describes some change in velocity over time. The convective acceleration (b) is an acceleration caused by some change in velocity over position, for example the speeding up or slowing down of a fluid entering a constriction or an opening, respectively. Both these terms make up the inertia terms of the 1-dimensional Saint-Venant equation. The pressure gradient term (c) describes how pressure changes with position, and since the pressure is assumed hydrostatic, this is the change in head over position. The friction term (d) accounts for losses in energy due to friction, while the gravity term (e) is the acceleration due to bed slope. Shallow water equations can be used to model Rossby and Kelvin waves in the atmosphere, rivers, lakes and oceans as well as gravity waves in a smaller domain (e.g. surface waves in a bath). In order for shallow water equations to be valid, the wavelength of the phenomenon they are supposed to model has to be much higher than the depth of the basin where the phenomenon takes place. Shallow water equations are especially suitable to model tides which have very large length scales (over hundred of kilometers). 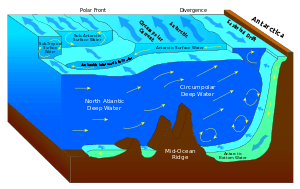 For tidal motion, even a very deep ocean may be considered as shallow as its depth will always be much smaller than the tidal wavelength. Tsunami generation and propagation, as computed with the shallow water equations (red line; without frequency dispersion)), and with a Boussinesq-type model (blue line; with frequency dispersion). Observe that the Boussinesq-type model (blue line) forms a soliton with an oscillatory tail staying behind. The shallow water equations (red line) form a steep front, which will lead to bore formation, later on. The water depth is 100 meters. ↑ "The Shallow Water Equations" (PDF). Retrieved 2010-01-22. ↑ Clint Dawson and Christopher M. Mirabito (2008). "The Shallow Water Equations" (PDF). Retrieved 2013-03-28. 1 2 Saint-Venant, A. J. C. Barré de (1871), Théorie du mouvement non permanent des eaux, avec application aux crues des rivières et a l’introduction de marées dans leurs lits. Comptes Rendus des Séances de l’Académie des Sciences, vol. 73, pp. 147–154 & 237–240. 1 2 Chow, Ven Te (1959), Open-channel hydraulics, McGraw-Hill, OCLC 4010975, §18-1 & §18-2. ↑ Brunner, G. W. (1995), HEC-RAS River Analysis System. Hydraulic Reference Manual. Version 1.0 Rep., DTIC Document. ↑ Searby, D.; Dean, A.; Margetts J. (1998), Christchurch harbour Hydroworks modelling., Proceedings of the WAPUG Autumn meeting, Blackpool, UK. ↑ Havnø, K., M. Madsen, J. Dørge, and V. Singh (1995), MIKE 11-a generalized river modelling package, Computer models of watershed hydrology., 733–782. ↑ Yeh, G.; Cheng, J.; Lin, J.; Martin, W. (1995), A numerical model simulating water flow and contaminant and sediment transport in watershed systems of 1-D stream-river network, 2-D overland regime, and 3-D subsurface media . Computer models of watershed hydrology, 733–782. ↑ Novak, P., et al., Hydraulic Modelling – An Introduction: Principles, Methods and Applications. 2010: CRC Press. ↑ Scharffenberg, W. A., and M. J. Fleming (2006), Hydrologic Modeling System HEC-HMS: User's Manual, US Army Corps of Engineers, Hydrologic Engineering Center. ↑ DHI (Danish Hydraulic Institute) (2011), MIKE SHE User Manual Volume 2: Reference Guide, edited. ↑ Bates, P., T. Fewtrell, M. Trigg, and J. Neal (2008), LISFLOOD-FP user manual and technical note, code release 4.3. 6, University of Bristol.